After two days carving our way up the east coast of Malaysia, with the South China Sea out over our right arms while driving through plantations of palm trees, today we turned north-west, driving in brilliant sunshine through rain-forests, then narrow one-car-width tarmac lanes, leading into a short and twisty gravel Test Section, to finally arrive at a rollercoaster drive through the Cameron Highlands. In short, it’s been a brilliant day – one of the finest drives the E.R.A. have put on in any event for a long time, packed with variety and offering something for everyone. Rarely do days come together as good as this. Today has shaken up the leader-board yet again. We have a new leader of the Classics Category – the test-section was short, with lumpy bumpy gravel, but it clearly suited the big Leyland with its growling V8 engine, as Gerry Crown and Matt Bryson were to end up re-taking the lead of the Classics, demoting the Datsun of Grant Tromans and Simon Russell to second place. Best time of the day was delivered by the Porsche 911 of Peter Lovett, with a time of 3:37, to Gerry Crown’s Leyland on 3:40, which was matched exactly by the flying VW Beetle of Garrick Staples, who put in a dazzling display of long lurid slides and car control, but the little Beetle missed a control later in the afternoon, and the penalties incurred sent the VW crew spinning down the leader-board to 23rd. 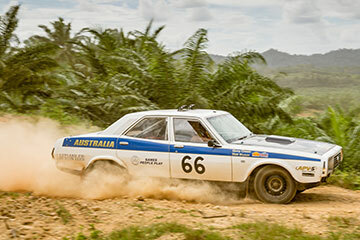 The Datsun’s time on 3:56 reflected a wrong turning on the Test-section. So, Paul Merryweather moves up to fourth spot in his Mercecdes 300SE, and Rob Garnsworthy’s yellow Mustang is now fifth. The unlikely Chevrolet Bel Air of John Rich, surely the biggest car in the event, is now running a surprising 7th place in the Classics division. Mention should be made of the solo entry in the Touring Category. Having fun but not eligible for official results, Joost Van Cauwenberge from Belgium has set some dazzling times in a big Toyota Landcruiser 4x4, his time today was just two seconds short of the best time, on 3:39, and given that the course was very narrow and twisty, this effort was a remarkable sight to witness... co-driver Christine de Landtsheer was hanging onto the roof. In the Vintage Category, the leader remains the Chevrolet of Bill Shields, with Phil Garratt’s Chevy Coupe in second – Bill posted a best time of 4:07, Phil Garratt was on 4:18, but the challenge of the Alvis from Rudi Friedrichs went down the gulley today when he slid wide on a tight left hand bend, missing a ditch by inches and finishing a few inches from the feet of the film-unit, who then had the job of towing out the Alvis… which then stormed off, still eager to make up for lost time. This car had put up a great fight to scrap with the leaders, but the final results of the day sees Rudi and Helga sink to 11th. Daniel Day and Ron Doyle in their fairly standard Chevy Coupe are the new third-placed challengers in the Vintageant category, Jim Clark moves up to fourth in his Ford V8 and Lars Rolner’s Bentley is now fifth. 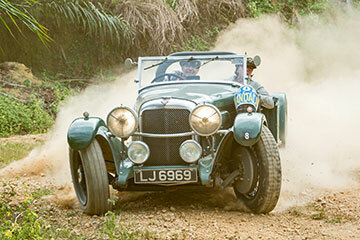 David and Karen Ayre in the 1907 six-litre Itala were early on the road today and going well. Tomorrow is promising another day of adventures, as we have to contend with last minute re-routes due to flooded roads from recent storms. There is a terrific atmosphere within the rally tonight and the imaginative route-plan from John Spiller and Anthony Preston has set the event alight, with the leaderboard changing daily in the scrap for top honours.